You might have read my complaint that Apple, the tech leader in all things accessibility, somehow had managed for nearly two decades to not bother with Closed Captions in their media software for professionals. 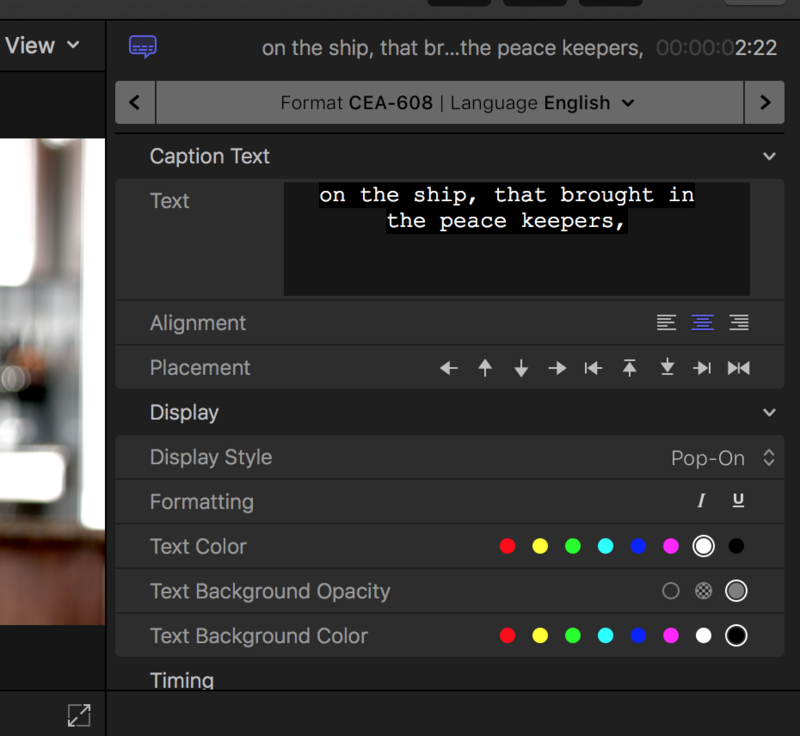 While adding in tools for effects, for color grading, key, multi-cam, and so many other useful tools, we all were stuck waiting for good captioning tools. 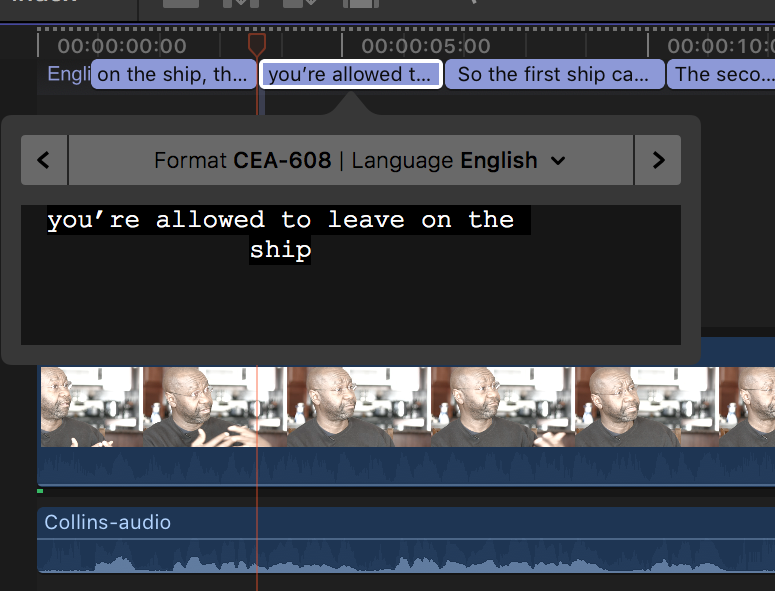 With the release of Final Cut Pro 10.4.1 we have Closed-Captions for everyone! Having friends who are deaf or hearing-impaired, I have been making sure that as much of my work as possible was captioned because it’s important. It was not, however, easy. I was using Moviecaptioner, which works ok but isn’t ideal as you’d still had some failings when it came to final output. Most of those failings could be laid directly at the feet of Apple. Moviecaptioner would make CAE-608 compatable .scc files, but Apple’s Compressor wouldn’t always accept them, and the error codes Compressor generated were mind-numbingly useless. You could usually spend a bit of time (hours) and find the issue, resolve it, and get it working, but it took forever. The other option was using MacCaption, which is what most production houses would use. It was what all caption houses used, and it’s a fine piece of software that worked slightly better, but not much better than Movcaptioner. It cost SIX THOUSAND DOLLARS back when I first had to do captions, and I see that Telestream, which bought it at some point in the last few years, has reduced the cost to a still unreasonable $1,750. For one seat. Without most of the functions you really need. Gee thanks. For comparison, that’s more than the entire Adobe Creative Collection, which includes a video editor, Premier, a print publication tool used by massive institutions, InDesign, and stables such as Photoshop and Illustrator. Oh, it also includes After Effects, which is in use at 100% of the effects houses producing little-known movies like Black Panther and Star Wars: The Last Jedi. Yet somehow a piece of software that literally just encoded text at timecode, with some metadata about color and position, costs several times more than this bundle. There’s a damned bargain for you. Anyway, so back to captions in FCPX. Check out this screen. That’s the caption window. Then in the panel on the side, you can add text and set the styling you want. That’s bloody amazing. And super easy. Import from a text file, or just type them as you go, and it’s really just option-c to create a caption at your playhead position. It’s attached to that time, and you can drag it’s beginning and end to the exact timing you want, and you’re done. Nothing hard about it. Currently, you can only make CAE-608 and ITT captions. ITT are the most common type requests as most modern systems can use them, so that’s the default. YouTube, Vimeo, etc., can import those directly. CAE-608 are the broadcast standard closed-captions that we all see when we are watching with the sound off because we’re at the gym and they don’t let you blare the latest episode of Jessica Jones over the loud speakers. These are generally white on black text, and sometime they cover things you’d like to see because people don’t set them right. 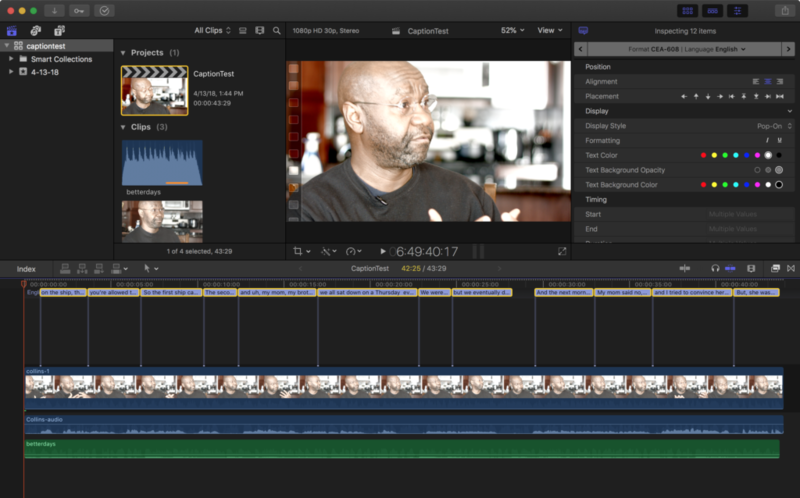 Currently FCPX doesn’t support the newer CAE-708 captions, which gives you more formatting control than the 608 captions do, but considering that most systems can’t yet display 708 captions, even though they’ve been out for almost a decade, this gap is understandable. And not a deal breaker at all, since you can use all the advanced settings of 608 captions, which include color and position controls that do most of what you need. Is it perfect? No. It’s it worlds better than what we have been dealing with? Yes. Yes it is. And it’s so easy to do that everyone should be doing captions for everything.